Partner Sonjui Kumar (Corporate Law) will participate in the panel CLE discussion, “Serving on a Non-Profit Board”. 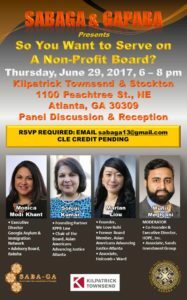 The CLE-eligible event, sponsored by SABAG and GAPABA, is scheduled for Thursday, June 29 at 6:00pm at Kilpatrick Townsend & Stockton in Atlanta. All the attorneys serving on the panel have served or are currently serving on nonprofit boards while practicing law. Sonjui Kumar is the current chairman of the board of the Asian American Legal Advocacy Center, an organization dedicated to fostering the social, economic and civil rights of Asian Americans in the Southeast. She also is a member of the board of GIACC (The Georgia Indo American Chamber of Commerce) and a long time charter member of The Indus Entrepreneurs (TIE), Atlanta Chapter. To RSVP for this event, email sabaga13@gmail.com. Food and drink will be provided and CLE credit is available.